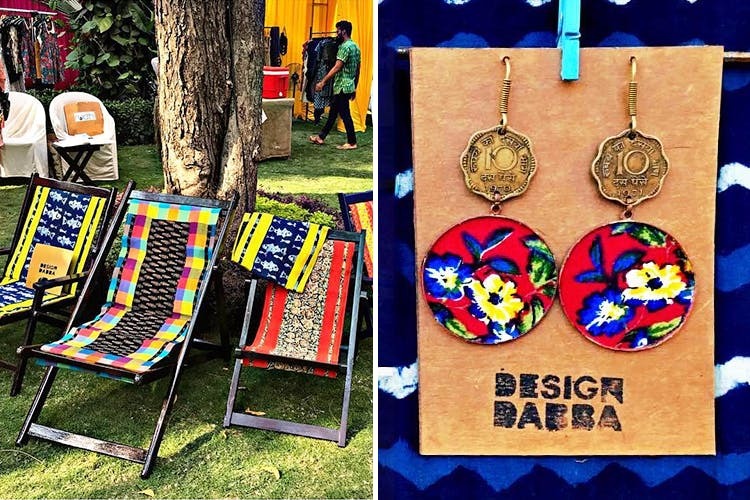 Design Dabba is a Gujarat-based brand that does block-printed diaries, convenient foldable chairs and beautiful coin earrings. It's a venture that endorses all things Indian, colourful and handmade. As an architect student, Niraj (Design Dabba's founder) visited some old cities in Gujrat for research purposes.There, he visited 100 year-old buildings and came across a bunch of discarded old coins. Later, he used these coins to create earrings and that's when Design Dabba was born. Today, this brand is an Instagram and Facebook store that stocks the most stunning traditional earrings made out of old one rupee and 10 paise coins. Their earrings, that come in so many shapes and colourful indie prints can be such a cute addition to your plain old kurta. Design Dabba also stocks the most lovely diaries that remind us of our favourite block-printed kurta. They've got indigo, ajrak and kalamkari-like prints, to name a few. We also recommend this brand's wooden folding chairs to anyone who wants to add a bit of colour to their home but don't have to much space for bulky furniture. These easy-to-store (& use) folding chairs also come in a variety of traditional fabrics, which, you can always customise. We actually came across Design Dabba a few months ago and they had a lot more options on their IG account during the time. However, they seem to have cut down on the number of options now but we really wish they'd bring those earring and diary designs back too. Get in touch with them via Instagram (and not Facebook) for a prompt response (Niraj usually replies within a day). Also, you can get him to customise earrings, diaries and even chairs as per your preferences (he'll charge a bit extra, of course). Price: Diaries - INR 250 to 450 (depending on the size), furniture - INR 3500 to 4500 and earrings - INR 350 to 1250.